Why Courtesy? 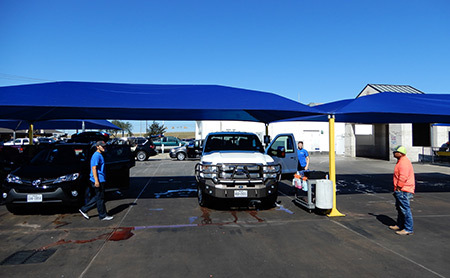 Our Car Wash was built on the idea of serving people, and we continue that to this day. We started in the business in the 80’s as a single, full-service location. Now more than 30 year’s later, we’ve grown to include our full service location, a quick lube facility, and an exterior service location. We offer a variety of wash packages and services and quick lube services for complete maintenance on your car, truck, or SUV. Our ultimate goal is to make sure you’re happy with the product you paid for and the car wash you received. So if you are dissatisfied for any reason, please let us know. We respect your feedback and will do what we can to make sure you drive away happy in the cleanest car in town. We aim to impress you with our high service standards. From a heartfelt greeting to careful attention to your vehicle’s clean car needs, our team has decades of experience in simply “being the best” in our industry. Our professional wash menu offers something for everyone. We pride ourselves on our systemic, thorough, and detailed wash packages, available at the best prices around! We handle your vehicle with care, allowing you to drive away in a shiny , clean car. We use gentle cleansers, clean water, and scratch-free equipment.